A total of 2 matches were played today of the ongoing FIFA World Cup 2018 friendly matches. The match wise highlights of all 2 matches are appended below. 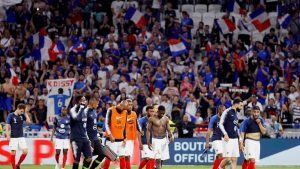 France had the advantage of playing at home and the willingness to keep their win streak going prior to the FIFA World Cup 2018 in Russia. On the other hand, USA came into this match after suffering a loss from Ireland. France were dominating the possession and the attack shots in the 1st half, but USA’s defenders were not letting them through. But just as the 1st half was coming to an end; USA’s Julian Green produced a smart finish and netted the goal at the 44th minute to put his team in the lead. France, one of the World Cup favorites were now under pressure against a young American side no less. In the 2nd half, the Frenchmen increased the intensity of their attacks. But, USA were keeping them at backfoot by not letting them score a goal. The scores were now level and France wanted to score one more to keep their win streak alive. At the dying moments of the match, Nabil Fekir took his chances to score but was denied by USA’s goalkeeper Zack Steffen. One of the favorites to win this World Cup, Brazil won their final warm-up game against Austria with a win. Gabriel Jesus put Brazilians in the front by scoring a goal in the 1st Austria couldn’t draw the scoreboard as the 1st half came to an end with Brazil in the lead. Austria hoped to bounce back in the 2nd half, but Brazil were in no mood to let that happen. As, Brazil’s prized attacker Neymar struck a goal at the 63rd minute followed by Coutinho who scored at the 69th minute to give Brazil a 3-goal lead. Brazil were dominating Austria in every aspect of the game. From ball possession to taking total shots at the goal, Brazilians completely outplayed Austria to win this match.